1. Six Crows by Leo Lionni – this is a great children’s book about peace. 2. The story of John Newcomer from Plant a Seed of Peace by Rebecca Seiling (Herald Press). Newcomer was a Mennonite who made hunting rifles for a living in the early 1770s; when he was pressured to sell guns to the new U.S. government for military use he stopped making them altogether, switching to other blacksmithing work. 3. Peace Tales: World Folktales to Talk About by Margaret Read MacDonald – About 30 good folktales — no illustrations, though. 4. Peace stories from the Old Testament. ..I. Abraham makes peace with Abimelech. Genesis 21: 22:34. Abraham establishes peace with the Hebrews’ former enemies, the Philistines. ..II. Joseph forgives his brothers after they sell him into slavery. Begins at Genesis 37. Why is this a peace story? Because forgiveness has something to do with peace. ..III. 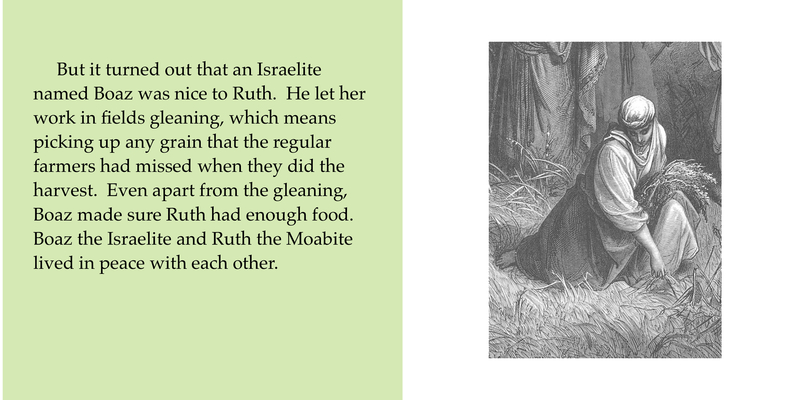 The story of Ruth and Boaz: Boaz treats Ruth, a foreigner, well. The story is explained in the book of Ruth; especially Chapter 2, verses 5-12. Why is this a peace story? Because Ruth was a stranger in Israel, and a foreigner; and often throughout history, strangers and foreigners have not been treated well. But Boaz was kind to her. Being kind to foreigners has something to do with peace. ..IV. Jonah: The crew of the ship is kind to Jonah, for a few minutes anyway. The book of Jonah, Chapter 1, through the first half of verse 13 explains how Jonah asks a ship’s crew to throw him overboard, but AT FIRST they do not. They at least make an effort to save him. I think this is a tiny peace story embedded in the larger story of Jonah. I’ve heard from people who disagree with me, about this; but I think that strangers making an effort to save a guy who is clearly bringing them very bad luck is admirable and worth pointing out to children (at least). ..V. Swords to plowshares: Micah, Chapter 4, verses 3 and 4 is one of the places in the Old Testament where this appears. I like the phrase in this version in which “no one will make them afraid.” I think of all the children over the centuries who have been made afraid by the warmongering choices of their parents, and I like that verse. Okay, there you are, you can stop reading. 5! My new book: A Map and a Mule, two stories from the life of Queen Isabel of Portugal. Isabel was a peacemaker of the 1300s who helped prevent one war by assisting with drawing the border between Portugal and Spain, and prevented a battle between her husband and their son (!) by riding on a mule between their two armies. This is a short book (24 pages) for children preschool through about 2nd grade. 6. Why is the dove a biblical symbol of peace? First, a dove appears in the story of Noah and lets him know that the destruction of the flood is over. Second, a dove was a symbol of The Holy Spirit. Finally, Jesus used the dove as an example of innocence when he gave directions to his disciples. On Veterans’ Day we remember veterans, which means soldiers who fought in wars. My grandfather was born in 1899 and he was drafted into the army when he was 17 or 18. “Drafted” means the government told him he had to join. He fought in an artillery unit. (I showed a photo of him from later in his life.) During the war he was seriously wounded in the abdomen by a bullet or a bomb. He made it to a field hospital and was told he would survive, but that he needed to eat as little as he could for several days, because his stomach was not working right and could not handle the food. His sister came to visit him and felt sorry for him because he was not eating. She brought him a lot of food, and she encouraged him to eat; he did so, and that almost killed him. That is what happens in war. Young men and women go away from their homes and families; some of them do not come back at all, or they come back wounded, sometimes for life. (And then sixty years later — within his lifetime! — the soldier’s grandchildren might well be told that the soldier was on the wrong side of the war, and/or might not be able to see the point of the war in the first place . . . I did not say this while delivering this Children’s Time story.) This is why on Veterans’ Day we remember veterans; and we remember to help, like we always do, any veterans who have come home wounded, or who have come home without jobs; and we work to make sure that we avoid wars so young people do not have to go fight in them. Enemy Pie by Derek Munson is a very good peace book for kids. A dad teaches his son how to get rid of an enemy – a new neighbor boy. fɑcts to uѕ, keep іt up. can I GET STORIES ON ‘PEACE’ FOR A competation.